While not America’s most popular golf destination, the rolling farmlands, meandering streams and rich forests of Western Pennsylvania make for some great golf. The Commonwealth of Pennsylvania is home to more golf courses per capita than any other state - more than 700 in total, of which about 500 are open to the public. The courses of Western PA line valleys, straddle hills and follow mountaintops; the diverse landscapes and changing seasons offer challenges to even the most experienced golf veteran. Golfers in the Allegheny National Forest and Erie Shore Regions of Northwestern PA have a lot to choose from including Foxburg Country Club , the oldest golf course in continuous use in the United States. In the Pittsburgh Region, a variety of courses are all within a short drive from downtown including the rugged beauty and challenges of the nationally acclaimed course at the Olde Stonewall Golf Club in Ellwood City and the Quicksilver Golf Club in Midway, popular for its difficult greens and country club feel. Other good courses with more reasonable fees include the Grandview Golf Course , which offers spectacular views from almost every hole; Cedarbrook which offers two great 18-hole layouts in Belle Vernon; and Riverview, a very challenging and well-kept course in Elizabeth, PA. In the Laurel Highlands Region of Southwestern PA, home to the legendary Arnold Palmer, serious golfers can enjoy a relaxed and unique mountain setting at the Nemacolin Woodlands & Spa. The resort offers two excellent 18-hole courses including Mystic Rock. Designed by the legendary Pete Dye, this course promises golfers a challenge like no other. The 6,832-yard course was three years in the making, and received top honors from Golf Magazine and Golf Digest in its opening year. More flexible tee times and affordable weekend trips can be found at other great courses including Tom’s Run at Chestnut Ridge and Champion Lakes Golf Club (ranked in the top 50 public courses by Golf Digest magazine). While our focus is public courses, no list would be complete without mentioning two of Western PA’s world-renowned private courses. Oakmont Country Club , rated #5 in the U.S. by Golf Digest and site of the 1994 U.S. Open, is best known for its ferocious putting surfaces, which non-members can try for themselves at one of several public charity events held at the club each year. The challenging and picturesque Laurel Valley Golf Club in Ligonier also ranks among the top 50 courses in the U.S. on many lists. Like a classic piece of art, the Pocono Mountains of Northeast Pennsylvania – a must-visit destination for generations – have stood the test of time. While the grand resorts of an earlier time remain and stand watch over the four-county region, new resorts have joined the mix. Visitors returning after years away will recognize the quaint charm of this mountain setting, but many Pocono Mountains properties have undergone a reinvention to meet and exceed the needs of today’s savvy traveler. Home to hundreds of holes of golf by legendary, Golden Era designers such as Donald Ross and A.W. Tillinghast, as well as the modern master – Jack Nicklaus – the Pocono Mountains golf properties are plentiful and as varied as any destination in the country. The Country Club at Woodloch Springs is nationally recognized by GOLF Magazine as "one of the finest courses in America" and rated “4.5 Stars” by Golf Digest’s Best Places to Play. Woodloch’s spectacular, 18-hole, championship, par-72, Poconos golf course winds its challenging way over 6,579 yards of fern-carpeted forest, lush wetlands and broad upland meadows. 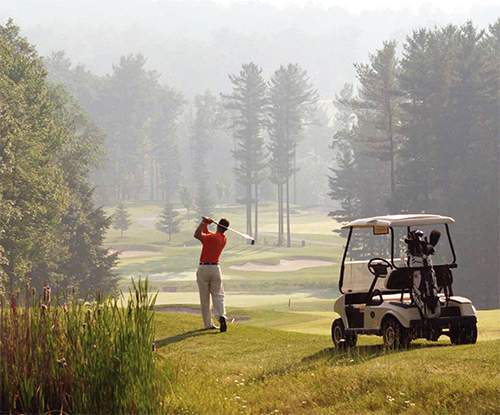 Whether searching for a challenging course that will test the lowest handicapper or a beginner-friendly track with equally budget-friendly prices, the Pocono Mountains offer something to match any level of play. A similar dichotomy exists in design – from tight, tree-lined fairways and postage-stamp greens to wide open layouts with expansive putting complexes and long views of Mother Nature’s beauty.